Portland, ME - The Eastern League of Professional Baseball is pleased to announce that New Hampshire Fisher Cats manager Sal Fasano has been selected as the winner of the 2011 Eastern League Manager of the Year Award. In his first season in New Hampshire, Fasano has led the Fisher Cats to an Eastern Division-best record of 71-60 (.542). Included in that record is a record setting month of May when the team went 23-8 to set a new franchise record for wins in a single month. New Hampshire currently has a four game lead over the second place Reading Phillies in the Eastern Division standings. If the Fisher Cats can hold on and win their division it would be just the second time in franchise history and the first time since 2004 that the team has finished the regular season in first place in their division. Sal has been joined on his coaching staff with the Fisher Cats this season by pitching coach Pete Walker, hitting coach Justin Mashore, coach Danny Solano and athletic trainer Robert Tarpey. 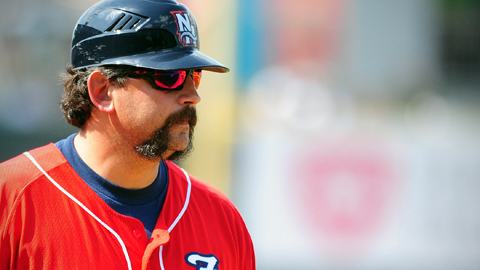 Fasano joined the Fisher Cats this season after making his managerial debut with the Lansing Lugnuts of the Class-A Midwest League in 2010, leading the team to a record of 70-69. Lansing finished in third place in the Eastern Division standings in the first half of the season with a record of 36-33 and their record of 34-36 in the second half was good for a fourth place finish in the Eastern Division. Prior to his managerial career Sal spent parts of 11 seasons as a Major League player. He was originally drafted by the Kansas City Royals in the 37th round of the 1993 draft and made his Major League debut as the starting catcher for Kansas City at Baltimore on April 3, 1996. Fasano went on to hit 47 home runs and drive in 140 runs in 427 games in the Major Leagues. Harrisburg manager Tony Beasley finished second in the voting for the Manager of the Year Award and Bowie skipper Gary Kendall finished in third place in the voting. The award was voted on by respective Eastern League managers, sportswriters, radio and television broadcast personnel and other members of the media.